VCS organisers were anticipating a large turnout for the first round after enjoying a sensational series in 2017. 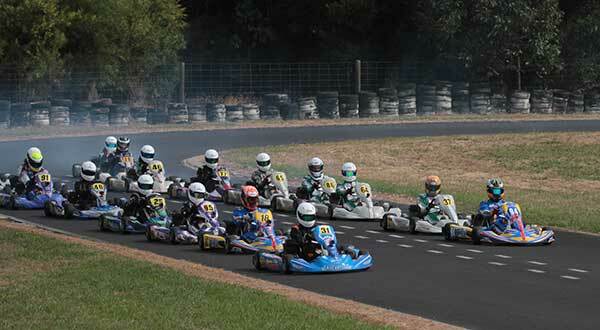 But not even the most optimistic estimates imagined that 242 karters would turn up to fill the pit area at Cobden for the opening round of 2018. It is believed this is the biggest VCS event in at least 10 years, and possibly the biggest in its history. WOW! 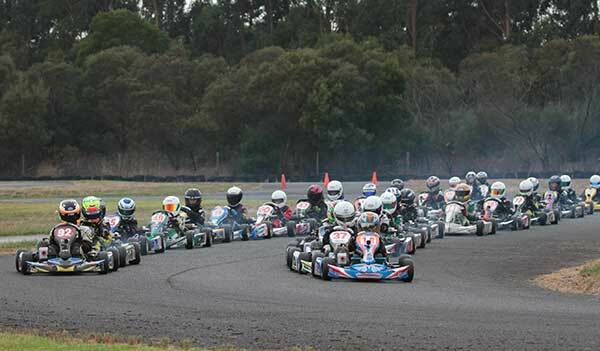 So large were the entries that the Cadet class came close to filling the 36 kart grid, and in an unusual move the series had to cap entries at 36 (the norm for oversubscribed classes is A vs B vs C heats). Kerbrider picked a great time to become the naming rights sponsor for the series, with only a handful of other events around the country expecting more entries this year. 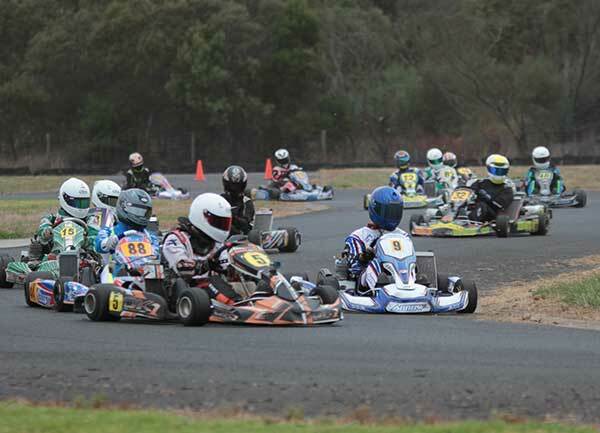 The weather provided perfect conditions for some very exciting karting, with pleasant temperatures and any rain held off until the drive home Sunday afternoon. In the off-season there had been plenty of talk about the brand new class. Would the lighter KA100 have the advantage and dominate the field, or would the more powerful TAG engine come to the fore? 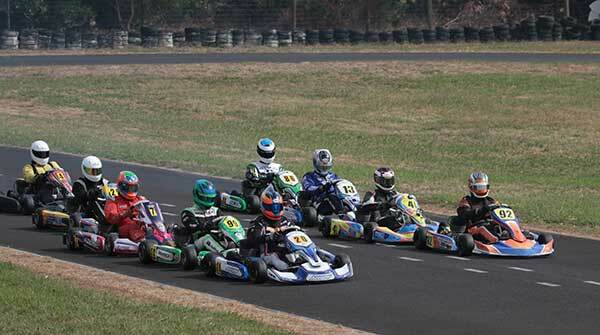 The new class proved popular, with 20 entrants for the debut, and three KA100 engines in the mix. Overall winner Ian Branson (KA100), and 2nd place Phil Smith (TAG) were within a tenth of a second all day. In heat 2 the best laps of both drivers were within 0.003. Perennial front runner Mick Angwin has moved to Restricted Medium in 2018, leaving a space to be filled on the podium. Newcomer to the series Cameron Austen took it up to the regulars including Peter Sloan, Martin Golledge, Andrew Harvey and Brett Jenkin. After shuffling order throughout qualifying and the heats, it would be Jenkin to come through for 2nd in the final, with Peter Sloan taking 3rd. 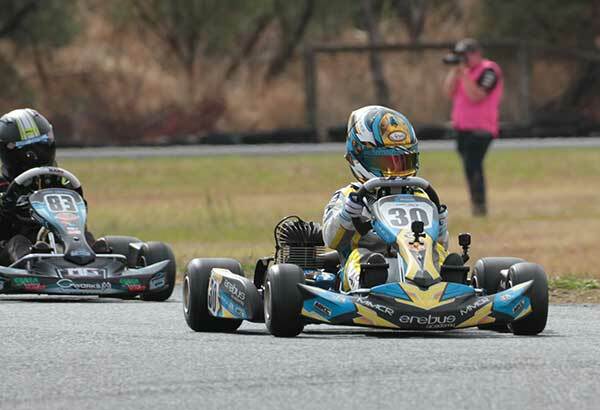 20 juniors would take to the track for qualifying, and the trio of Jobe Stewart, Nicholas Sacco and Christian Cowie immediately stamped their mark on the event with great times within a 10th of each other, but with a slight edge on the rest of the field. As expected from the qual times, the first heat was close, with Stewart and Sacco having a drag race to the flag, Sacco taking the heat by 0.066. Sacco would again win in heat 2 from Stewart, but Stewart would get his revenge in the final, taking the win after a fantastic all day duel for the lead. Cooper Johnstone came like a bolt from the blue in the final, starting from 5th, but coming home in 3rd with great pace only 0.3 seconds behind 2nd. A very talented field arrived for KA3 Senior Light, including James Sera, Jack Bell, Jack Martin. A number of regular VCS faces made their first appearance as a senior against the pros, including Jaxson Cox, Corey Herbetson, Nathan Williams, Wil Kelly-Merrifield and Tyler O’Leary. All of the class of 2017 looked like they were handling themselves well, but it was Jaxson Cox that took it to James Sera, grabbing pole by 0.143 seconds. Cox managed to hold off Sera in the heats and it was building to be an exciting prospect for the final. Sera got the jump in the final and the slide n guide method into turn 1 would see him hold off Cox but having to defend hard for 8 laps. Cox pushed past Sera in turn 1 to gain the lead, but a slow exit allowed 3rd placed 37 Jack Bell to jump both front runners for the lead out of turn 2 with 1 lap to go. It all boiled over at the back of the circuit where Sera would make contact with Cox trying to reclaim the position ending both drivers’ day. Corey Herbertson and Bryce Woollard would make hay immediately by taking the now vacant 2nd and 3rd steps on the podium, Bryce passing 4th place Jack Martin on the last lap. Remo Luciani is still the dominant force in KA3 Medium, grabbing pole by 0.106 from Ryan Aitken. Mitchell would unfortunately DNF the heat, and Remo would not lose the lead again all day. Mitchell came back to grab 2nd in the final, taking the position from Ryan Aitken who had looked the second best kart all day. Mitchell may have challenged Remo again for the lead without the shortened final. 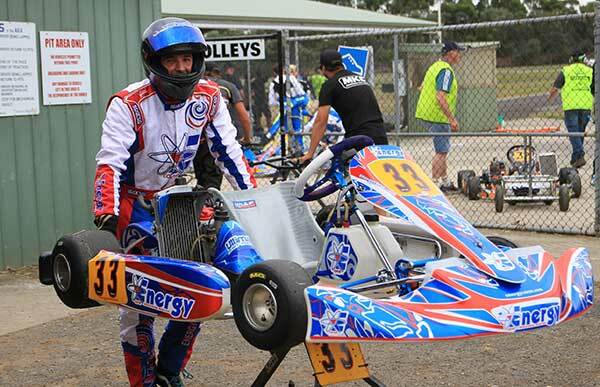 Jackson Hodgetts would grab 4th with great pace on debut in KA3 Senior Medium, followed by Chris Thomas in 5th. 35 entries meant a lot of nervous and excited parents for the weekend. Unfortunately one entry would not make the grid, with poor Ruby Gibson injuring herself on a hover board Friday night, and having to watch the racing with a cast on her arm. Did this deter any other cadets from screaming around on their scooters and segways as soon as the stewards weren’t looking? Not at all: one Cadet saying “I’m a pro and it wouldn’t happen to me”. When qualifying got underway, it would be clear that Matthew Domaschenz and Jesse Lacey were at the sharp end of the field. James Piszcyk was very fast in 3rd in his first round of the series. 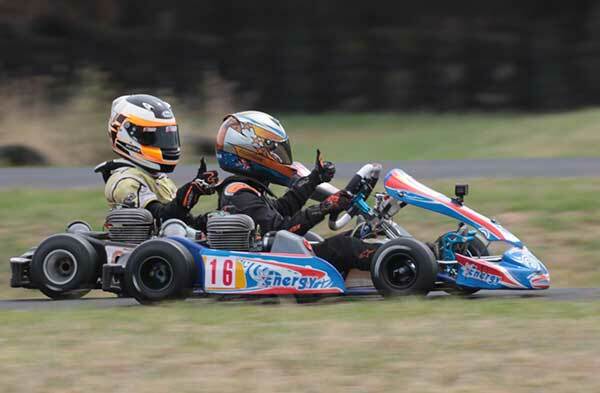 Heat one saw the return of Lacey and the duel between Domaschenz recommence from previous years, with the two young drivers crossing the line side by side, Lacey the victor by 0.006 seconds. A few DNFs resulted from a first corner tangle with such a young field learning the sport, but they all learned and the racing was generally very clean and well behaved. Domaschenz would grab the lead on the first lap in heat 2, followed all the way by Lacey to shape up for a great final. There were battles up and down the field, with Fraser Carr, Brodie Thompson, Isaac Woodhouse, Thomas Schmidt and Brocklan Parker all in contention should the leaders make a mistake. Disaster struck Jesse Lacey in the final, level with the leader around the outside at turn 1, the kart dropped back off the racing line towards turn two and caught an unfortunate bump that saw the kart retired on the infield. Domaschenz would briefly lose the lead to Piszyck, but retake the lead on lap 2 with a decisive pass into turn one. James Piszyck stepped up to 3rd, and Toby Dvorak came home in 3rd after being in the second half of top 10 all day. Fraser Carr and Brodie Thompson would take 4th and 5th, with Thomas Schmidt, Isaac Woodhouse, James Lodge, Caleb Spence and Parker Scott rounding out the top 10. 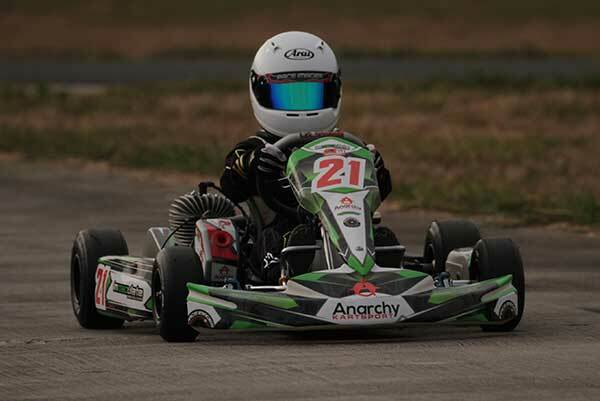 Daniel Hookway and Johnny Hill had a comfortable 3 tenths on the field in a 23 kart qualifying session (a big increase from last year’s entries in the class) . A gaggle of drivers were within 0.7 to fill the top 10 positions. Heat one saw a big incident in turn two that brought on a spin for Lachlan Swayn with the result of Riley Jabke of Gippsland flipping over Lachlan. The race continued under a full course yellow for 6 laps with the last 3 laps under green resulting in Daniel Hookway 1st, Johnny Hill 2nd and Samuel Davies 3rd. Winston Smith would be knocking on the door a fraction behind 3rd place at the flag. Heat 2 was a much calmer affair, with Hookway maintaining enough of gap from Hill in second all race. Once lap one calmed down in the final, Hookway was never troubled for the win. Joel Johnson made his way steadily up through the field and would finish 2rd with Johnny Hill in 3rd and Winston Smith in 4th, then a large margin to the rest of the field. Local Max Fahey would be the biggest mover, starting from 11th and finishing 6th in the final and ruing a dodgy plug earlier in the day. 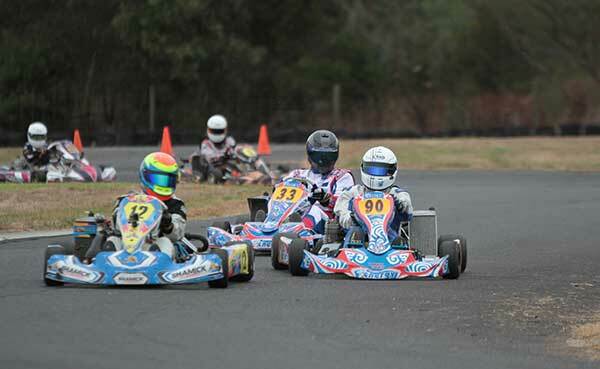 Lachlan Hill and Joseph Clough were the only two karts to break into the 44 second lap times for qualifying. The next 10 karts were separated by about 0.5 seconds, so there was always going to be some good battles in this field of 25 competitors. Lachlan Hill and David Menzel would jump to the top in heat 1, while Clough and Westerveld traded places for positions 3 and 4. Hill and Clough would take the top two spots in heat two, followed closely by Andrew Sotiropoulos. The touch paper was lit for the final, and Hill and Clough were battling for the lead until lap 8, when turn one contact ended Clough’s race and relegated Hill to 7th. Sotiropoulos stood to benefit the most, powering onward to take to the win. Ross Stubbs came from nowhere in the heats to take 2nd place in the final, with Billy Westerveld hot on his heels for 3rd. Perennial VCS front running brothers Scott and Adam King had a new challenger with Glenn Croxford claiming pole position with a blistering 43.194. The King brothers filled positions 2 and 3, followed by Andrew Jackson and Ryan Aitken (Both on double duties with KA3 Senior Medium). Scott King would work his way past Glenn on lap 3 of heat 1, while Ryan Aitken would jump up to 3rd. King and Croxford would trade positions again in heat 2 before King took the chequered flag as Croxfords’s kart dropped off in the later laps. Adam King would dual with Ryan Aitken to get back to 3rd place. TAG 125 included an international entrant from New Zealand in Ashleigh Stewart. The last time a young kiwi competed in the series was Scott McLaughlin in 2008, so no pressure there then. Domenic Romeo would claim pole position from Clint Smith and James Fyfe. Alexander Barallon would claim 4th in the ultra competitive class on his first race up from restricted light. The next 10 places all qualified within 3 tenths. Domenic Romeo would not hold on to the front position for very long, with Clint Smith getting the perfect start from the lights and opening up a surprising 5-6 kart length lead early in heat one. But a slight mistake at railway saw Barallon make the most of it and take Smith for the lead on lap 3, and never look back. Barallon would again take the win in heat 2, this time challenged all the way by Mark Domaschenz. Jordan Rae and Anthony Mrhar made an appearance in the top 5 ahead of Romeo. The seasoned Romeo would dice hard with Domashenz for the first few laps, before locking his sights on the leading kart of Barallon. Barallon couldn’t believe his luck at this stage – he looked like heading to a comfortable victory but, Romeo would catch him in the last lap, and due to Domashenz having a broken throttle cable on the last corner of the last lap this took the fight out of the drag race to the line. Commentator Michael Yeo would run down to the in grid to get the reason from a very exciting final. Barallon would still claim second, with Mark Domaschenz rolling over the line for third. Jordan Rae, Harley Benson and Anthony Mrhar would finish next, all taking advantage of misfortune for Jordan Rae who DNF’s from 4th with one lap to go. 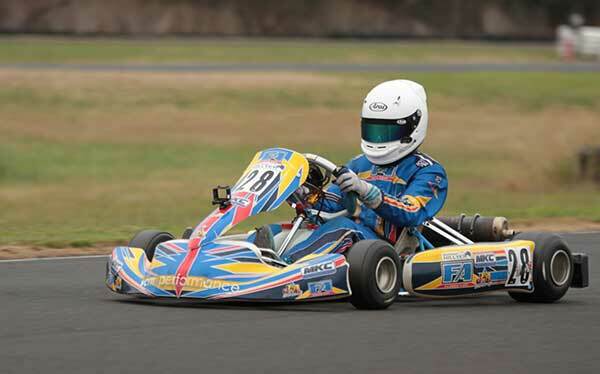 Matthew Hillyer was the karter to beat in KA3 Junior. 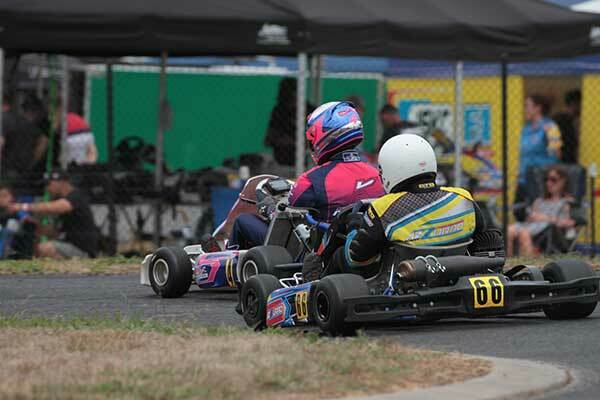 Qualifying on pole by 3 tenths was a huge advantage when the next 10 karts were covered by the same margin. Hamish Allen, Kai Upiter and George Cower would battle for the next steps on the podium after some lap one dramas relegating front runners Bettess and Oliver down the field. Hugo Simpson would jump up and grab that second spot in heat 2, with Kai Upiter in 3rd. No one got near Hillyer in the final, but Hugo Simpson in 2nd did put in the valiant effort of setting an identical fastest lap to the leader (44.695). Lap 1 shuffled up the top 10, and Aaron Oliver gained the most, claiming 3rd from 8th on the grid, finishing right on the tail of second place. The huge size of the Cadet 12 field may explain the unusually small size of the Cadet 9 entry list; a gaggle of Cadet 9s have just made the transition to go up an age group in 2018. Rusty Ponting was taking no prisoners on his home track, with a handy advantage of a few tenths on the field. P-plater James Anagnostiadis was impressive on debut, looking for the lead in heat one and two before coming home in second in heat one, and third in heat two. Xavier Avramides and Charlie Evans would take the final two podium spots in the final separated by just .04 seconds, relegating the newcomer to fourth. Rusty Ponting didn’t put a foot wrong, winning the final by 1.7 seconds. 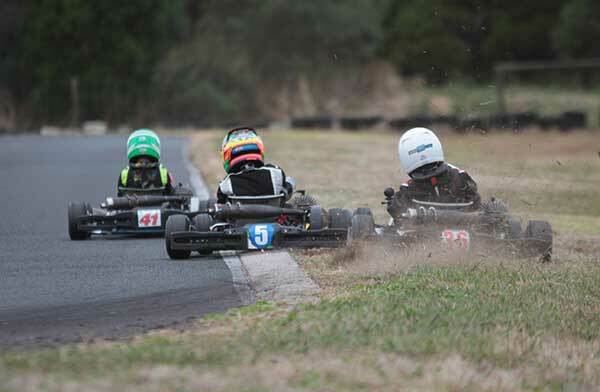 The next round is at Ballarat Kart Club on April 22. 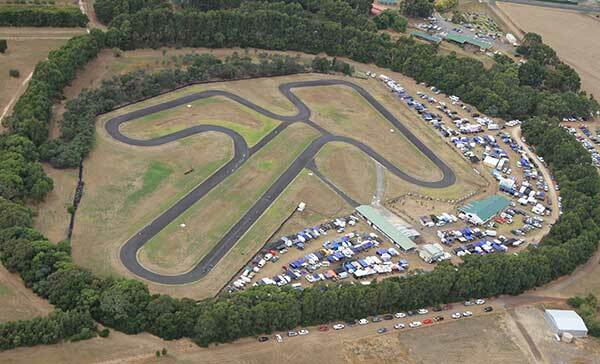 Ballarat is an old school track with over 50 years of history.